While out with divers at Prison Rocks this afternoon, we were treated to various spectacles, including a gull standing on the water (above) and Eskil doing his internal assessment work (below). We also saw one tugboat, then a second tugboat come around William Head followed by a frigate, the HMCS Ottawa. The frigate was being escorted and assisted by the tugboats as she headed to the Navy dock in Pedder Bay. The Ottawa certainly dwarfed our Pearson College sailboats! 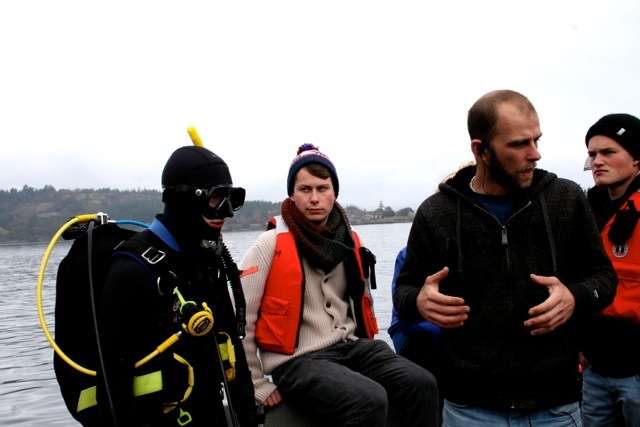 While it may not be their preferred dive site, second year divers immersed themselves in the seawater of Pedder Bay and went diving around the Pearson College dock on Friday 18 November and again on Monday 28 November. Below are Marie-Claude, Aurora and Maya, pretty happy after a decent dive. 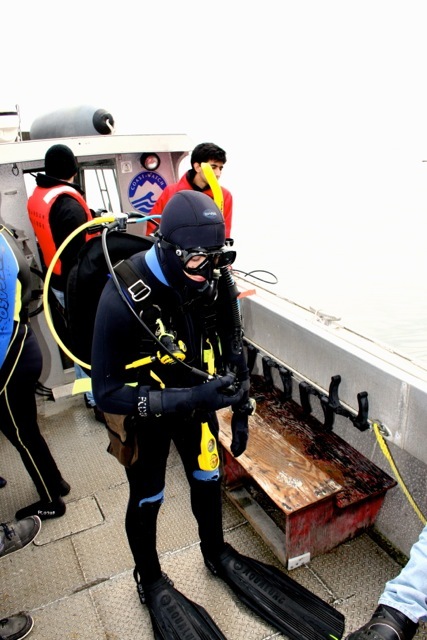 Divers did a good service by collecting debris that has been accumulating under the dock for many years (see the previous generation of caf dishes!). Below are photos from 18 November and 28 November. Garbage collected on 28 Nov. Garbage (and treasure!) collected on 18 Nov.
We released a crab from the plastic bottle (above, middle right of photo on left). 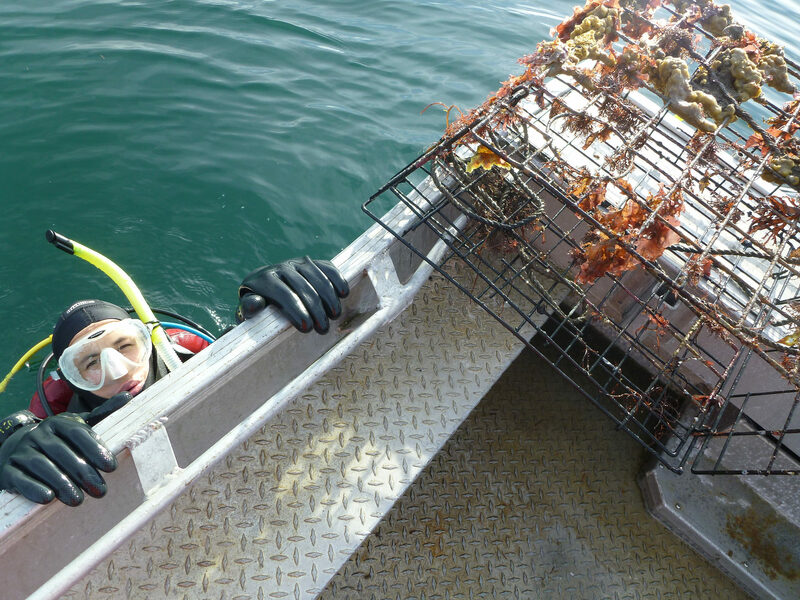 Ian collected two crabs (Cancer productus and Cancer gracilis) seen below in the photo on the left. Maya surfaced from her dive this afternoon at Swordfish Island with a Puget Sound king crab carapace on her head. She even managed to keep her hat on as she boarded the boat! 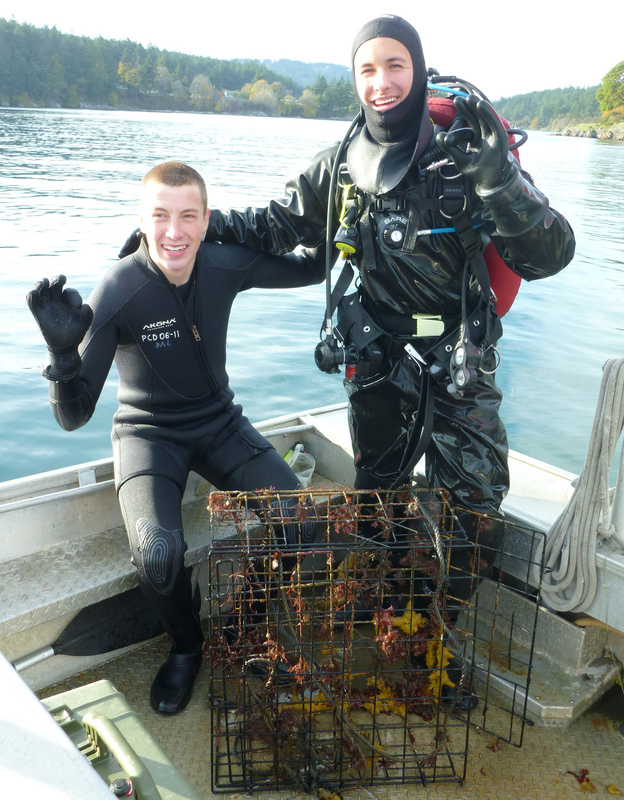 As part of their CAS week project, divers Benoit, Isaac, Hiro and Sabrina attempted to recover some of the crab traps that have been abandoned in Pedder Bay. 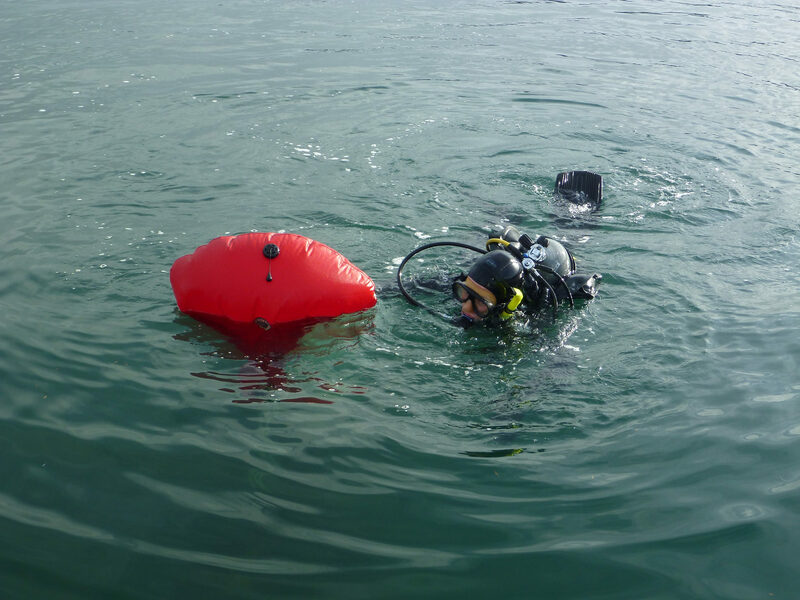 They did two dives on Tuesday, the first of which was successful only in that they “recovered” our anchor! 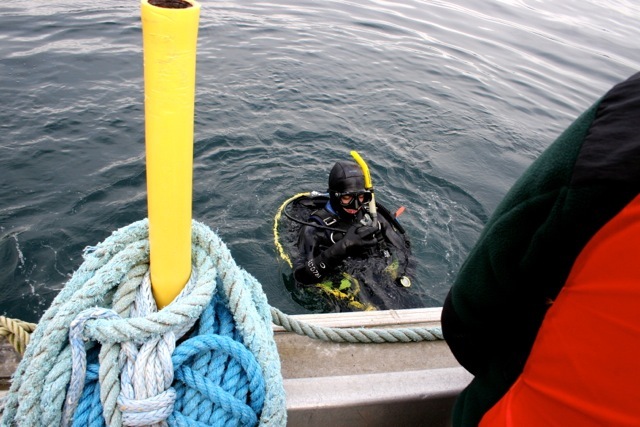 On the second dive, however, Benoit and Isaac did locate a crab trap then used a red lift bag to bring it to the surface. In the photo above Isaac is swimming at the surface and Benoit just below the surface to bring the trap to the boat. 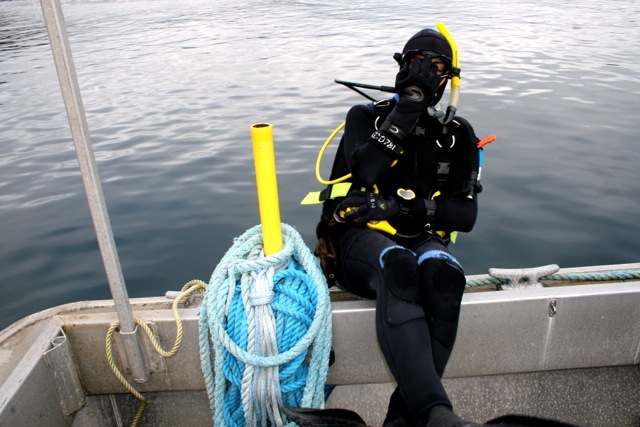 The photos below show the crab trap on the boat Hyaku and two proud divers! On the trap there were a few species of red algae and yellow encrusting sponge with a few decorator crabs crawling around. Well done team! Thanks for this series of photos, Taylor!